Office Space - Waarland, North Holland. At this centre, businesses can benefit from highly adaptable, non-branded, open-plan offices. With excellent accessibility in a location to the north west of Waarland, this serviced office is suitable for up to eight persons. 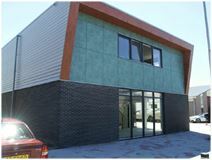 This is a contemporary building set in a popular business park that is very green, creating a refreshing and pleasant atmosphere in which to work. The surrounding area offers shops, cafes and supermarkets.